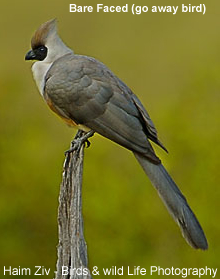 The Bare-faced Go-away Bird (Corythaixoides personatus) is a Turaco found in Burundi, Democratic Republic of the Congo, Ethiopia, West Kenya, Malawi, Rwanda, Western and Central Tanzania, Central / South-east Democratic Republic of the Congo (formerly Zaire), Rwanda, Burundi, South-west Uganda, and North-east Zambia. These turacos inhabit fairly open country, frequenting trees along river courses. This turaco is large, restless and noisy. It is easily distinguished from the White-bellied Go-away Bird by its bare black face. Both sexes are gray in color. Female has a green beak. Has a characteristic long tail and crest. Legs, feet and the male's bill are black. Adult measures about 20 inches in length. Their preferred food consists of berries. Nests are built mostly in tall acacia trees. Female lays 2 to 3 greenish-white oval eggs. If you are interested in purchasing a Turaco, please visit this website for available birds and pricing. If you can't find the species you are interested in, contact David Jones directly for a referral (over his website).